Coupon Classes Start Tomorrow! Sign Up Now! I will be teaching Coupon Classes at The University of Texas in Arlington in their Continuing Education program. The classes begin tomorrow, Tuesday, April 9th, and run thru April 30th, 2013. 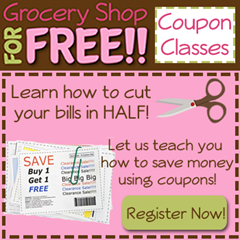 You can cut your grocery & drug store bills by 50% at least! PLUS – it’s fun & easy! So, if you’re ready to get started – sign up now!